From goodreads: No longer in high school, Chloe Lilywhite is now living and working in Annar, the Magicals’ city-state plane of existence. Since moving, she’s joined the Council, gone on missions with the Guard, moved into her own apartment, and enrolled at the University of Annar. Plus, she’s happily engaged to be married to Jonah Whitecomb, the literal man from her dreams, not to mention her Connection. While she still struggles with aspects of her craft, Chloe feels like she’s finally coming into her own, especially after a difficult year that had her questioning nearly everything in her life. A Matter of Heart, the second book in the Fate Series and it’s absolutely captivating. I was lost in world filled with Magicals and it was heart-stopping the entire time, dare I say it was even more intense than the first book. Don’t even get me started on the Elders…I think they aged me! Heather Lyons is simply said, a brilliant author and she has the ability to create characters that are complex and filled with depth that go along with a story that is incredibly colorful and heart wrenching. Her writing is fluid, authentic and perfect, not to mention that she will command your full attention (she had me at Kellan)!!! This story did things to me…it stressed me out the entire time and I felt as though my heart would break repeatedly. Chloe has the weight of the world on shoulders because she’s a Creator and she always wants to do the right thing because of who she is BUT as she sorts all this out there’s a matter of her heart and yes, pun intended. She’s connected to TWO…not one but TWO Emotionals who are Jonah and Kellan. This is the MOTHER of ALL love triangles and ultimately it takes a toll on Chloe. How do you pick between two brothers who are perfect and yet, unique in their own way? How? She’s drawn to both like a moth to a flame and because she knows she shouldn’t be drawn to both, the battle rages within her to figure it out. And because this love triangle is stressing her out to the point of making her ill, she makes a selfless decision to stop what is driving them all crazy, but is that really the answer? I don’t think there could be any better answer. Am I being vague?? You betcha…I’m hoping I’m so vague that I’m driving you mad with curiosity! I hope the curiosity is so intense it will make you buy the book so you can understand what I’m referring to. The pace of this story is quick and intense but not rushed. It’s a well-developed and thought-out story, one that has so much detail that everything will come to life in your imagination and you will feel every heart breaking moment. I’ve over-simplified everything in a poor attempt to express how much I love this book. Everything you want and need in a story is in this book; brace yourself for an emotional rollercoaster ride that will leave you wonderfully exhausted!!!! I’ve never read any books by this author. I do love this genre of books. I’m excited to add her to my book list. Hi Lucy!!! I’m a big fan of Urban Fantasy and the Fate Series will stretch your imagination and don’t even get me started on the love triangle. Heather Lyons is a master storyteller. 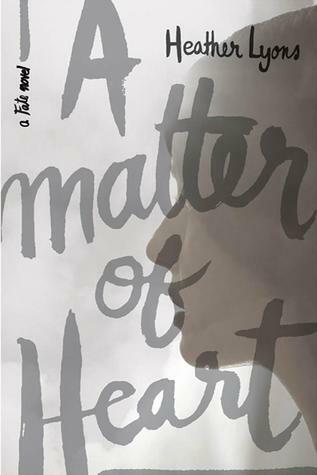 A Matter of Heart is the first book and it’s still on sale…I wouldn’t wait too long to buy it as I’m not sure how much longer it will be $.99!!! Let me know what you think of the book when you are done! I’m glad!! This is a great book to read!